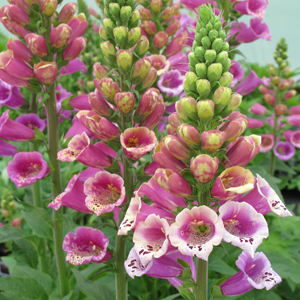 (Foxglove) Digitalis ‘Candy Mountain’ is the first foxglove ever to have upward-facing flowers instead of the usual downward-facing ones! This unique feature allows you to view the beautifully speckled flower throats from above instead of having to get down on your knees to see their true beauty. In early summer, the ‘Candy Mountain’ rose pink flowers completely surround the strong flower spikes and make a dramatic look for the back of the border. This plant is a biennial.